Free Shipping on All Toda Racing products. TODA Racing campulleys allow precise tuning of camshaft timing. 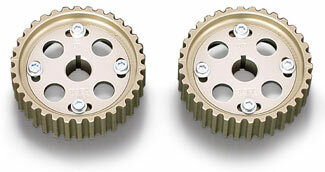 Adjustable campulleys are essential when using TODA camshafts or any non-stock performance camshaft. TODA campulleys are made completely from 7075 aluminum while our competitors use 6061. 6061 is a cheaper grade of aluminum and is easier to produce on CNC machines, therefore is cheaper to produce. 7075 is a more expensive and higher grade of aluminum commonly found on fighter aircraft landing gear or other high stress areas. The use of 7075 aluminum allows TODA Racing to offer the strongest and lightest campulley on the market. In addition, our advanced timing degree system makes TODA campulleys the most accurate on the market. For long term durability the timing marks are machined into the metal, not painted on, or silk screened, therefore they will not rub off with age. Copyright 2002 IPS Racing Inc.